Top: Mia ’25, Johnasia ’20, La’Fayia ’20, and Sarabi ’20 put their dreams on paper while working on vision boards. Bottom: Tara Mardigan, marathon runner and professional nutritionist addresses attendees while Suejona ’19 and Zeinab ’19 listen attentively. Assitan ’24 shows off her creative vision board projects before getting on court with attendees. National Girls and Women in Sports Day honors the progress and achievements of female athletes. This year’s 33rd annual celebration, led by the Women’s Sports Foundation, included a community event at StreetSquash on Saturday, February 9th. StreetSquash has built a tradition of encouraging athletes to push past stereotypes to accomplish more than they thought possible, and has included the annual celebration of female athletes into the yearly program schedule. 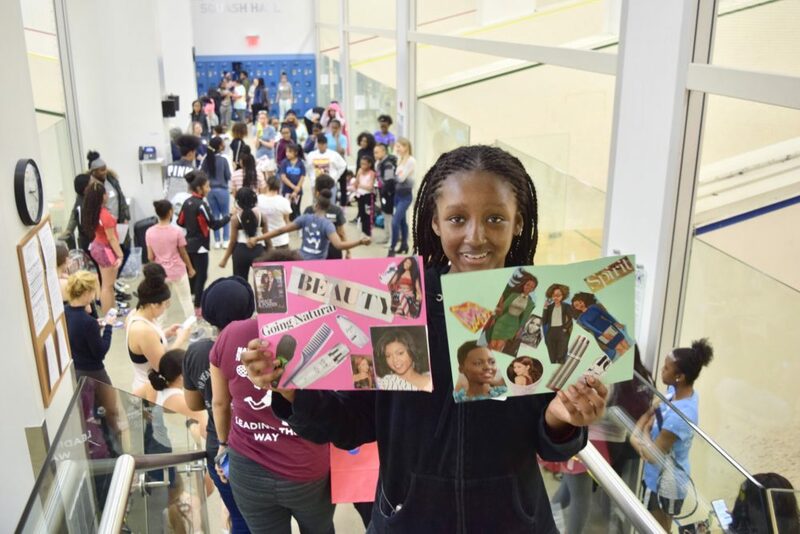 Throughout the course of the event, the building bustled with activity and positive energy, from the squash courts filled with eager athletes, to the classrooms, which featured workshops for students and attendees to connect on a different level. 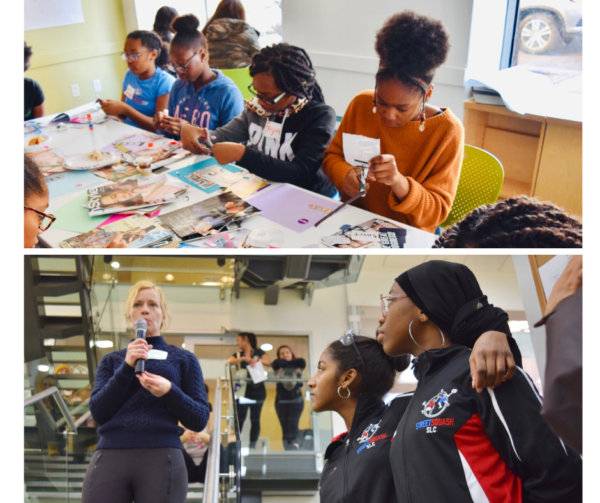 While some attendees created homemade lip scrubs and oatmeal face masks in the do-it-yourself skincare workshop, others joined a meditation class, played squash, or manifested their goals for the future while creating vision boards. 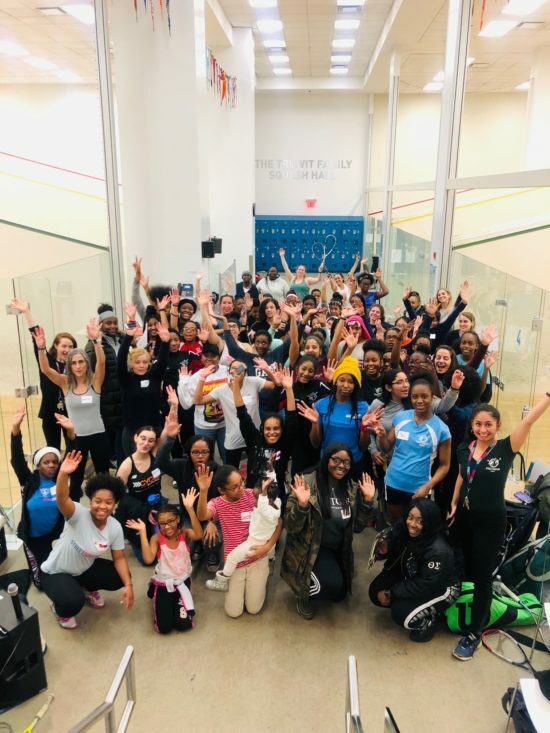 Over 70 members of the StreetSquash community filled the SL Green StreetSquash Center to celebrate female empowerment with squash and creative workshops. “This year’s turnout was impressive,” shared Jennifer Ng, Director of College Success and Alumni Support, who directed this year’s event. “Not only were current students mingling with alumni, but we also got the chance to bond with supporters, volunteers, parents, and friends. It’s heartwarming to celebrate our larger, diverse community beyond our building.” As always, the event concluded with raffle prizes and a dance-off, and a common appreciation for all of the female participants and those who support them in maintaining healthy, active lifestyles.